Leaf Extract, Benzyl Salicylate, Citronellol, Geraniol, Limonene, Linalool * 100% Natural Fragrance - Parfum 100% Naturel. 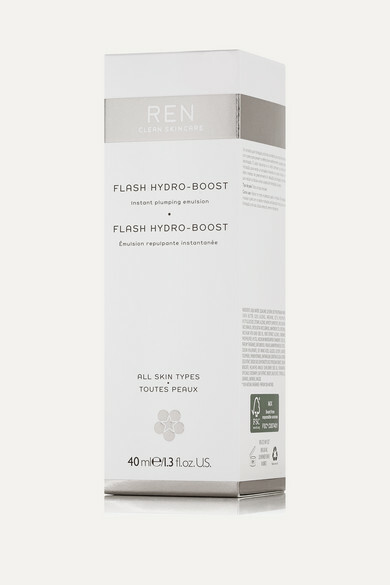 REN Clean Skincare's 'Flash Hydro-Boost' emulsion amplifies skin's water retention for a supple, ageless complexion. This instantly plumping formula is enriched with ultra hydrating Hyaluronic Acid and Xylitol that work together to draw in water, effectively preventing moisture loss, fine lines and wrinkles.